When hurricanes Harvey and Irma hit, the first healthcare concern was for residents' physical well-being. But as the floodwaters began to recede, another concern arose: mental health. Just as telemedicine services have connected clinicians to people in areas hit by the storms for traditional healthcare needs, they're doing the same for behavioral health. "Once the immediate physical danger has passed, then people start to experience the traumatic feelings of realizing that perhaps they've lost their home or maybe they're in great financial distress," said Dr. Sylvia Romm, medical director for American Well . "That's where the therapist can come in and help them move forward with their lives." American Well and others have included behavioral health in the free services they're offering post-hurricane. Telemedicine is particularly suited to assisting victims of natural disasters like these hurricanes because so many people have no permanent place to stay. "You have such large numbers of people who've been displaced," Romm said. "Even if they had a therapy relationship, chances are they wouldn't be able to access them any longer." That's because, as Larry Gleit, executive vice president of specialty care at MDLive points out, patients aren't the only ones who are displaced—providers are too. "Part of why telemedicine becomes so important is that all of the providers live in the community have just experienced the same natural disasters." What's more, there's already a shortage of behavioral health providers, Gleit said. "In general, there's a dependency and need to use virtual care," he said. "The need becomes compounded in situations like this." In the weeks after Harvey and Irma hit, MDLive provided free telemedicine visits for people in storm-damaged areas. Providers have been eager to help, said Alon Matas, CEO of Betterhelp, a division of Teladoc that's giving people in Harvey-struck areas three months of free online counseling (Teladoc is also offering free visits for those same people). "We had a lot of counselors reaching out to us before we started the program," he said, which has now had more than 200 patient sign-ups. If there's any good to come of these natural disasters for telemedicine providers, it's that they may reach an audience that wouldn't have otherwise known about them. "Disasters like this could be an opportunity for people who don't know how effective these telemedicine services are to experience them for the first time," said Nathaniel Lacktman, chair of law firm Foley and Lardner's telemedicine industry team. That, in turn, could be a boon for in-person providers, who could devote resources to people who need in-person care, he said. "These companies are in a position to reach patients without having to have onsite first responders." That wouldn't be the case in Texas if it weren't for a law signed last May. After a protracted legal battle involving Teladoc, the state began allowing providers to administer care for patients via telemedicine without first meeting in person, making it the last state to drop the requirement that providers meet patients face to face before providing for them virtually. 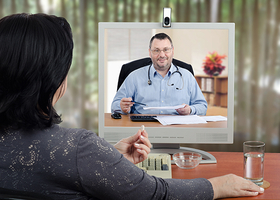 Florida, for its part, has no state definition of telehealth. The Florida Telehealth Advisory Council wants to change that and want insurers to cover telemedicine visits as they would in-person visits. The change in Texas law has proved crucial in the weeks after Harvey. "In general, there's a dependency and need to use virtual care," Gleit said. "The need becomes compounded in situations like this." Matas expects that need to continue in the months to come. "There's a recognition that the problems don't end when people feel well physically," Matas said. "The long-lasting and long-term effects are a lot about stress and anxiety. This is a source of trauma that needs to be addressed. The water is down but the feelings around it are just starting and will continue over the next few months."